Apple has been hard at work as far as iOS updates are concerned, with iOS 11, iOS 11.0.1 and iOS 11.0.2 all arriving within just three weeks of each other. It is unusual for Apple to push updates out to the public quite this quickly, but with bugs to be addressed, it did not really have all that much choice in the matter. With the newest version having landed just a couple of days ago, all eyes are on the update to see just what it is capable of. While the new iOS 11.0.2 release is clearly aimed at fixing the issues some experienced with crackling sound and other oddities, that does not mean that it is beyond the realms of possibility that the new version could offer a speed increase during the opening of apps, or booting of the device. That’s what YouTube channel iAppleBytes likes to test when a new release arrives, and that is exactly what has happened here. 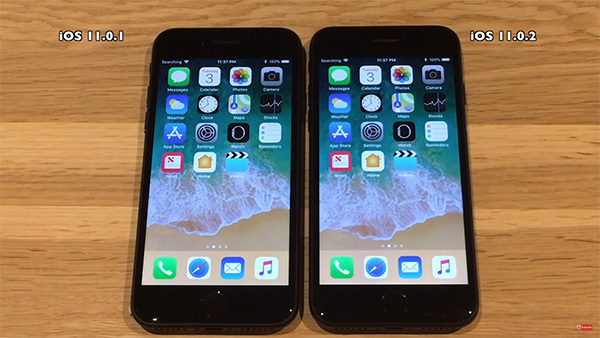 In order to carry out the tests, iAppleBytes took iOS 11.0.1 and iOS 11.0.2 and installed both on an iPhone 5s, iPhone 6, iPhone 6s, and iPhone 7 in order to see how the releases compared across both modern and aged devices. The results span across four different videos so if you are interested in how an older, or newer iPhone will respond to the update, then it may be worth being a little selective in which video you watch. The reason for that is simple – results vary. That being said, they don’t vary all that much. The one trend that can be noted is this: for the majority of iAppleBytes’ tests, iOS 11.0.1 performs better than Apple’s most recent release. Of course, if you suffer from any of the issues the new version addresses, the whole thing is moot – install it, be bug-free and enjoy or your device. It’s what Jony Ive would want.